They were the end of summer peaches; I had bought a couple of cases of seconds from Morton’s Orchards. What to do with them immediately? 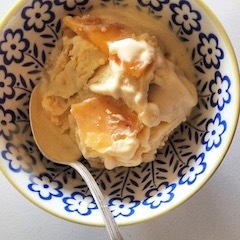 Peach ice cream – southern and will define my summer lavishly. 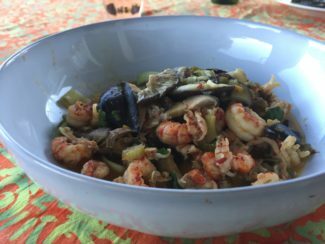 I found two interesting recipes and tried them both. Both were easy. One came out like traditional ice cream and one was more a soft cream. Recipes are below; when July comes around, try these out. An easy soft-serve alternative to the ice cream maker, this recipe comes from Sicilian chef Ciccio Sultano. If you've ever had the luck to taste Italy's gelato, you know that flavor is key to its heavenly appeal. This recipe is all about the peaches. *Crème fraîche can be made easily with fresh cream and buttermilk. Mix 3 cups of cream with 1/4 cup of quality buttermilk or quality store-bought crème fraîche. Cover with a lid and place in warm place. Leave for 24 hours or until cream is thick. Cut the peaches into very small pieces. The smaller you cut them, the faster they will freeze and the finer the final texture will be. Arrange the peach pieces in a single layer on a rimmed cookie sheet and freeze solid, about 2 hours. The single layer is important, as they are much easier to put back into the processer once frozen. Gently warm 1/4 cup creme fraiche and mix honey well with it. Put the frozen peach pieces in a food processor and grind briefly. Add the creme fraiche-honey mixture and remaining 1/4 cup of creme fraiche and pulse until the mixture is smooth. Empty the food processor into a small container and freeze again, 20 to 30 minutes, before serving. If the ice cream freezes solid, simply process it briefly again before serving, or let stand to warm slightly. GAPS friendly if you eat dairy. This is a GAPS friendly ice cream made with an ice cream maker. Mix 1 tablespoon of water with gelatin. Let sit for 5 minutes. Heat remaining water to a boil. Take off heat, let cool, then mix in the gelatin. Stir until gelatin is dissolved. When this mixture cools a bit, add the honey and vanilla; stir to combine. Add gelatin-honey mixture to crème fraiche and egg yolks. Mix well. Cool in fridge for a few hours. 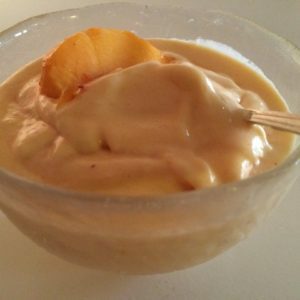 Add frozen peaches to ice cream maker container; pour crème fraiche mixture over peaches. Do not overfill! Start the machine and follow maker directions.